This article was last updated Nov 12, 2018, but some terms and conditions may have changed or are no longer available. For the most accurate and up to date information please consult the terms and conditions found on the issuer website. Frequent Walmart shoppers may have been asked to apply for one of the store’s two credit cards — the Walmart Credit Card and the Walmart Mastercard — or seen their prepaid debit card, the Walmart MoneyCard®, at checkout. While Walmart’s credit card and store card are decent choices, you may not want a credit card at all — in that case, you might consider the Walmart MoneyCard®. You can purchase this card for $1 online or at select Walmart locations and use it for all your purchases just like a regular credit card, but keep in mind your transactions are limited to the amount of money you’ve loaded — or “prepaid” — to your card. In this review, we’ll evaluate how the Walmart MoneyCard® works and how it compares to other prepaid cards. The negative part about prepaid debit cards is they often come with fees that can eat away at your balance; the Walmart MoneyCard® is no different. Not only does it charge the $1 card opening fee, but it also charges a $3 replacement card fee, not to mention various reload fees. Reload fee $0 to $4.95, depending on how you reload. See the “Reloads” section below for more detail. *ATM owner may also charge a fee. Your Walmart MoneyCard® can be used to make purchases everywhere Debit Mastercard® or Visa® debit cards are accepted in the U.S. If you want to withdraw money, you can at an ATM or at Walmart MoneyCenters and customer service desks. You can also write checks and send money to other participating cards issued by Green Dot Bank. You have several options when reloading your Walmart MoneyCard®. The best option is to fill your card by having your paycheck or government benefits automatically deposited via direct deposit; there’s no fee for direct deposit reloads. The most costly way to reload your card is to take cash and reload it on the Green Dot Network, which can cost up to $4.95 per reload. Online bank transfer $0 — but your bank may charge a fee. Walmart check cashing $0 — Standard Walmart check cashing fees and limits apply. Not available in all states or stores. This card stands out from most prepaid cards by offering a rewards program. Cardholders earn 3% cash back at Walmart.com, 2% cash back at Murphy USA and Walmart fuel stations, and 1% cash back at Walmart stores. Maximum of $75 cash back per reward year. A “rewards year” is 12 monthly periods in which you have paid your monthly fee or have had it waived. This rewards program helps to add value to your Walmart MoneyCard® and is especially great for Walmart.com shoppers. Deposit checks with your smartphone camera: There’s no need to go to an ATM to deposit a check, simply snap a phone and deposit it via the Walmart MoneyCard® mobile app. No overdraft fees: If you happen to charge more than what’s available in your account, you won’t be hit with a fee. Protected against unauthorized transactions: If your card is lost or stolen and fraudulent charges are made, you won’t be responsible for them. While Walmart shoppers may be tempted to open the Walmart MoneyCard®, you should consider alternative prepaid cards first. Cards like the Chase Liquid® and the Bluebird by American Express have fewer fees and simpler terms that can make using a prepaid card cheaper. If you’re looking to avoid the typical monthly fee that prepaid cards have, you should consider the Bluebird by American Express which has a $0 monthly fee with no strings attached. Unlike the Walmart MoneyCard®, you won’t need to load $1,000 to your card to waive the monthly fee. Another option is the Chase Liquid® which waives its $4.95 monthly fee if linked to a qualifying Chase checking account. This card clearly benefits loyal Chase customers, but beware it’s only available in the 23 states with Chase branches. Looking at the ATM fees, both the Chase Liquid® and the Bluebird by American Express have networks of over 15,000 fee-free ATMs where you can withdraw and deposit money at no cost. Unfortunately, the Walmart MoneyCard® lacks any sort of in-network, fee-free ATMs, making withdrawals and deposits more costly. However, the Walmart MoneyCard® does have a leg up on the competition in terms of rewards — neither the Chase Liquid® or the Bluebird by American Express offer rewards. Earning rewards is a nice perk of the Walmart MoneyCard®, but you shouldn’t base your decision around rewards, since the numerous fees may overshadow any cash back you earn. When it comes down to choosing between these three prepaid cards, you should consider what matters most to you — rewards or lower fees. Once you figure out the answer, you should be able to settle on the best card for your needs. Overall, the Walmart MoneyCard® is a decent prepaid card that really shines with its rewards program. If it wasn’t for the rewards, we’d recommend avoiding this card altogether. Still, this card can be an OK choice for frequent Walmart.com shoppers — you can earn the highest cashback rate at 3% on those purchases, compared to 1% at Walmart stores. However, even considering the rewards you earn, you should still check out alternative prepaid cards like the Chase Liquid® and the Bluebird by American Express mentioned above. These cards offer more features and have better fee schedules. 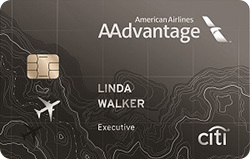 Who the card is best for If you’re a member of the American Airlines AAdvantage® loyalty program, the Citi® / AAdvantage® Executive World Elite™ Mastercard® is a great option for you. You Earn 2 AAdvantage® miles for every $1 spent on eligible American Airlines purchases & 1 AAdvantage® for every $1 spent on other purchases* — but it comes with a $450 annual fee.